ir Messenger Mobile is a fully featured alphanumeric paging software with TAP, SNPP, SMPP, ETAP, WCTP, and EMail support that allows you to send pages to Pagers and Digital Cellular Phones. The use of Air Messenger Mobile in your company can save you money by sending messages to your company Cellular Phones or Pagers and not having to actually talk to a person and therefore saves Air Time. SNPP allows you to send messages over the Internet to carriers such as Nextel, PageMart, Skytel, and others. SNPP and ETAP allow for message confirmation and additional features that are not support in the standard TAP/IXO protocol. 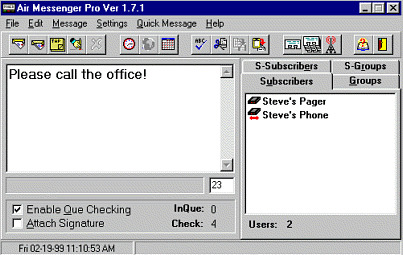 Air Messenger Mobile also has a built in Air Mesenger LAN Server client which allows you to connect to the server while in the office. Command Line utility also included. With an easy to use interface and easy setup makes Air Messenger Mobile a must have for all your messaging needs.